A few weeks ago when I visited the "Designing 007" exhibition at the Melbourne Museum I also looked for a tram in the City advertising the event. But alas no luck. And also as a side note here's some photos of the Regent Theatre where "King Kong" is being staged. Kong himself is awesome. He's a giant "puppet" with at least 10 handlers. When he walks the theatre rumbles and his roar is deafening. He's also very realistic right down to eyes that blink and also seem to show emotion. Apparently the giant "puppet" tooks years to design and create and I believe the show creators are hoping to take the musical to Broadway which would be very apt. If you're in Melbourne and haven't seen it yet I highly recommend "King Kong", but hurry as its season is ending very soon. When I was setting up the PizGloria.com website in late 2011 / early 2012, to speed things up I often added the book publishing details first before adding the cover images. To my surprise, once I'd finished loading all the cover images I realised I was missing a book; the first edition US Signet printing of "Doctor No" circa 1958. Somehow I thought it was already in my collection. 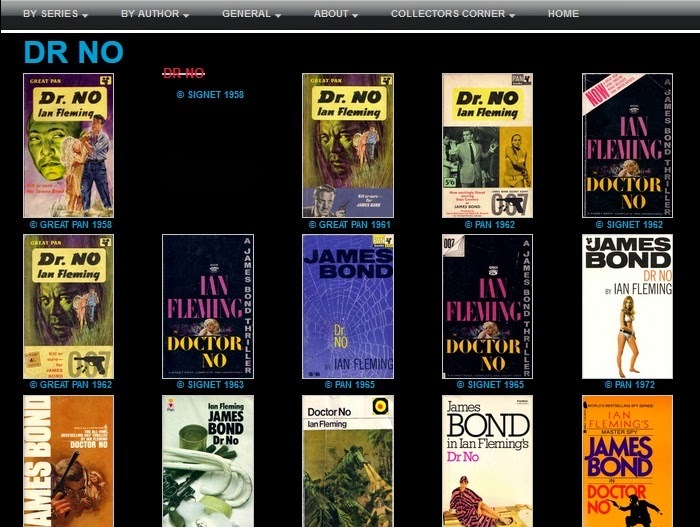 So instead of removing the publishing details, because I knew I would eventually acquire this book for almost two years my website has shown the "Dr No" covers with a space where the missing cover would appear. A number of visitors have noticed this missing cover and contacted me to say that my website was broken. In fact just 6 days ago Tim from the PAN Paperback Collectors Website commented that "One of your Signet Dr. No covers seems have a duff link". I assured him it was deliberate. And today that very copy of "Dr No" arrived in the mail. Soon I'll scan the cover, add the image to the website and the missing cover will be no more... finally ! This afternoon as my wife and I were driving home we passed a second-hand book store in Kew East so we stopped. I've visited Abra Card Abra Roycroft Antiquarian Booksellers many times in the past and blogged about the store a few times too. They always have a few early Bond paperbacks at the back of the store as well as a varied selection of Bond hardbacks upstairs. But when we arrived today, just after the store closing time of 5pm (yes, I was being optimistic for a Sunday) the front entrance was locked. As if teasing me for my tardiness though, a selection of Bond paperbacks were on display in the front window. Luckily I had them all, but I still would have liked to have checked out the other Bond books inside. Looks like I'll be organising another visit, this time during store opening hours. Late last week I received another copy of "SilverFin" in the mail. As you can see it was really well packaged for it's journey down under. This is a US "International Edition" published by Miramax Books / Hyperion in 2005. There appear to be so many different paperback / softback versions of the Charlie Higson "Young Bond" novels it's hard to catch up. In fact I have no idea how many different cover versions are available. I still refer to the very good but discontinued Young Bond Dossier website created by John Cox (of The Book Bond fame) where this same cover is described as the "International paperback". And there are plenty of other cover variations shown on this website I still don't have so I'm hoping most of them are harbacks which means I won't have to search for them ! I'll try and scan this cover and add it to the PizGloria.com website ASAP.